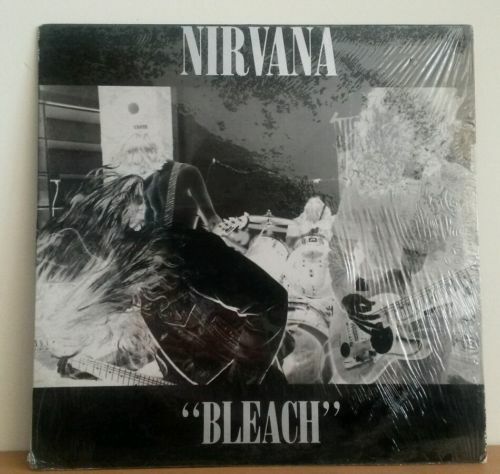 One of the most sought after release by Nirvana. This still has the shrink wrap to three sides.There is some evidence of the outline of the vinyl,but this is feint.The edges are still sharp ,some denting to the corners caused by storage. The folded poster is near mint.No holes etc. The vinyl is near mint,barely any sign of play. Both matrix numbers are correct. Recorded in Seattle at Reciprocal Recording for $600. The release is on white vinyl limited to 1000 copies and "some" included a Nirvana/Sub Pop poster.Some copies might have a slight dark smudging on the vinyl which is normal.The vinyl may not be perfectly white and have faint black smudges, as sometimes bits of different colour get into the mix, or get stuck in the machines from previous pressings. Jason Everman did not actually play any guitar on the album but at the time was playing live with the band, thus his name was included in the credits.